These boots are sold in US men’s sizes, so you can choose the size you normally wear in street shoes/boots. I would say these are a standard width (“D” width) boot. The side buckles have a wide range of adjustability, which should work for most anybody. With most adventure boots of this type, I take them out of the box sorta dreading putting them on, adjusting the buckles, etc, but WOW, these boots are so much easier and more comfortable than previous ones I’ve tried. The buckle system is new (new to me at least) and works so much better than ones in the past. And the straps are easy to adjust for length. The rest of the closure is a large Velcro close area at the top which will give you lots of adjustment around the calf area. The insides of the boots are lightly padded, smooth and comfortable. I really like the way they feel right out of the box. 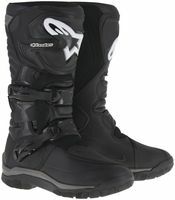 The boots, overall feel REALLY substantial, but when they are on, they don’t feel nearly as clunky as you might think. The sole is a very thick, heavy duty and stiff rubber unit that is bonded to the boot (not stitched like some off road types). If you are vertically challenged, you’ll gain some extra height! (see our close up photos for shaft height, sole thickness, etc). The boots have an integral waterproof lining and the gaiter across the closure comes up most of the shaft height, so you should get very good waterproofing.